The European Union has been one of the most vocal advocates of ‘sustainable development’, particularly in its dealings with developing countries. Even prior to the formulation of the UN Sustainable Development Goals (SDGs), the EU has insisted upon the need for sustainable approaches to poverty reduction and economic growth in the Global South. When examining EU relations with African countries as part of the African, Caribbean and Pacific (ACP) group, however, it becomes clear that the translation of Europe’s sustainability discourse into practice is highly problematic. Notably, there are concerns that the EU’s free market approach to development – embodied in its EPA trade deals – is incompatible with genuine, pro-poor forms of sustainable growth. Moreover, the EU is often seen as a hegemonic actor whose trade and aid interventions in Africa often do more to perpetuate poverty than to ameliorate it. 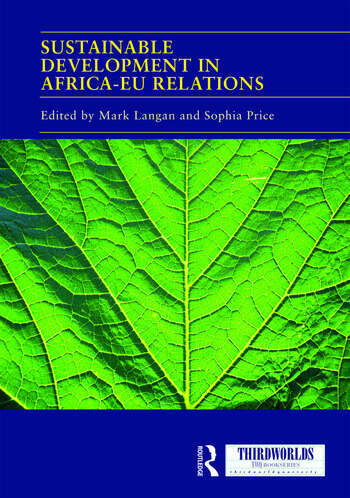 This book casts a critical light on Africa-EU relations with regards to the EU’s sustainability pledges. It does this through looking at an array of issues – not least trade, aid, the environment, and democratic institutions. In this vein, the book poses a challenge to EU trade and development discourse in the era of the UN SDGs. The chapters in this book were originally published as a special issue in Third World Thematics: A TWQ Journal. 9. Oil and cocoa in the political economy of Ghana-EU relations: whither sustainable development? Mark Langan is a senior lecturer in International Politics at Newcastle University, UK. His research examines the intersection of global trade and international development. He is particularly interested in EU trade and development co-operation with the African, Caribbean and Pacific states, and studies of moral political economy. Sophia Price is head of Politics and International Relations at Leeds Beckett University, UK. Her research focuses on feminist political economy, pro-poor development strategies, and the external relations of the European Union, particularly its trade and aid relations with the Africa, Pacific and Caribbean Group of States.